This artist's reconstruction shows a woolly rhinoceros grazing in the plains of northern Thuringia in Germany. Credit: Dionisio Álvarez. 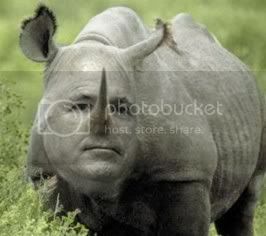 Talk about one ancient RINO! A woolly rhinoceros was just 12 years old when it died in a pool of meltwater flowing off an inland glacier in Germany. That was 460,000 years ago. Uno, Dos...One, Two, Tres, Quatro — ! RINO: The Other White Meat. A story about dead RINOs.